For other uses, see Van Halen (disambiguation). The Van Halen brothers were born in Amsterdam, the Netherlands, Alex Van Halen in 1953 and Eddie Van Halen in 1955, sons to Dutch musician Jan Van Halen and Indonesian-born Eugenia Van Beers. The family moved to Pasadena, California, in 1962. Young Edward first began studying classical piano, and became quite proficient (although he never fully mastered the art of reading sheet music). Eventually the brothers started playing music together in the 1960s—Eddie on drums and Alex on guitar. While Eddie was delivering newspapers to pay for his new drum set, Alex would sneak over and play them. Eventually Eddie found out about it, and out of frustration he told Alex, "OK, you play drums and I'll go play your guitar." The Van Halen brothers formed their very first band, called The Broken Combs, in 1964. As they progressed and gained popularity, they started to play many backyard parties and changed the name of their band to The Trojan Rubber Co. In 1972, the Van Halen brothers formed a band called Genesis featuring Eddie as lead vocalist/guitarist, Alex on drums, and Mark Stone on bass. They initially rented a sound system from David Lee Roth but decided to save money by letting him join as lead vocalist even though his previous audition(s) had been unsuccessful. By 1974, the band decided to replace Stone, so Michael Anthony, bassist and lead vocalist from local band Snake was auditioned. Following an all-night jam session, he was hired for bass and backing vocals. Sample of "Jump", the lead single from the band's sixth album, 1984. Centered around a synthesizer hook instead of the band's trademark guitar sound, and featuring anthemic lyrics, the song became the band's most commercially successful single. 1984 (released on January 9, 1984) was a commercial success, going five-times platinum after a year of release. Recorded at Eddie Van Halen's newly built 5150 Studios, the album featured keyboards, which had only been used sporadically on previous albums. The lead single, "Jump," featured a synthesizer hook and anthemic lyrics, and became the band's first and only No. 1 pop hit, garnering them a Grammy nomination. Other singles included "Panama" (No. 13 U.S.), "I'll Wait" (also No. 13 U.S.), and "Hot for Teacher." Three of the songs had popular music videos on MTV. 1984 was praised by critics and fans alike, peaking at No. 2 on the Billboard charts behind Michael Jackson's Thriller. Eddie invited Patty Smyth of Scandal to replace Roth but she declined. Eddie was then introduced by an auto mechanic to Sammy Hagar, the former frontman for the hard rock group Montrose, and at that time a solo artist coming off a very successful year. His hit single "I Can't Drive 55" came from his 1984 album VOA, produced by Ted Templeman who had also produced Montrose's first album Montrose, as well as all of Van Halen's albums up to that point. Hagar agreed to join and also serve as a rhythm guitarist on stage to add to the Van Halen sound. Following the release of the 5150 album, a tour was launched to support it across North America. Named the "5150 Tour," the title was a homage to the previous "1984 Tour" in support of the 1984 album. Footage was released on VHS and DVD as Live Without a Net. 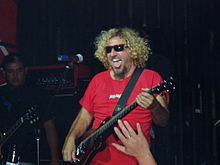 In the tour Hagar wanted to minimize the use of pre-Hagar Van Halen songs in the set, other than the band's best known classics. This was a trend that continued, with the expanding repertoire of Hagar-era songs slowly whittling away at the number of Roth-era songs on the set list. All four studio albums produced during this period reached No. 1 on the Billboard pop music charts and 17 singles breached the top 12 of the mainstream rock tracks chart. During that era, a single taken from 1988's OU812, "When It's Love," reached the Top Five, peaking at No. 5. In addition, Van Halen was nominated for two Grammy Awards. The band won the 1992 Grammy Award for Best Hard Rock Performance with Vocal for the album For Unlawful Carnal Knowledge. Van Halen continued to enjoy success throughout the mid-1990s. In 1995, Van Halen released the album Balance and supported Bon Jovi on their European Summer stadium tour. They also made a live album called Live: Right Here, Right Now. David Lee Roth called Eddie to discuss what tracks would be included on a planned Van Halen compilation (work on which had actually begun before Hagar's departure). They got along well, and Eddie invited him up to his house/studio. Shortly afterwards, Roth re-entered the studio with the band and producer Glen Ballard. Two songs from those sessions were added to the band's Best Of – Volume I album and released as singles to promote it. 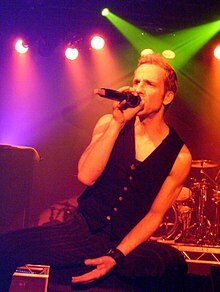 Van Halen's next lead singer was Gary Cherone, frontman of the then-defunct Boston-based band Extreme, a group which had enjoyed some popular success in the early 1990s. The result was the album Van Halen III. Many songs were longer and more experimental than Van Halen's earlier work. It was a notable contrast from their previous material, with more focus on ballads than traditional rock songs ("How Many Say I," with Eddie on vocals). Sales were poor by the band's standards, only reaching a Gold certification, despite the album peaking at No. 4 on the U.S. charts. However, Van Halen III did produce the hit "Without You", and another album track, "Fire in the Hole," appeared on the Lethal Weapon 4 soundtrack. The album was followed by a tour. The III Tour saw Van Halen playing in new countries, including first ever visits to Australia and New Zealand. "Without You" acquired No. 1 place on the Billboard Mainstream Rock Charts in 1998, the 13th song of theirs to do so, and thus making them the band with the most Mainstream Rock No. 1s. Eddie recovered from his hip surgery in November 1999, but from 2000 to early 2004 no official statements were made by Van Halen and no music was released. However, information about members past and present trickled in. The Van Halen brothers continued writing at 5150 Studios, Cherone recorded an album and toured with new band Tribe of Judah. One of the songs that Cherone had written for the scrapped second album with Van Halen, entitled "Left For Dead", would see its lyrics set to a new musical arrangement with Tribe of Judah. Responding to speculation that he had been approached to replace Cherone, David Coverdale said, "I called a mutual friend and said, 'Tell Eddie I had nothing to do with this.' It just got ridiculous. I've heard that they were going to approach me, but since I left Purple I've always done my own thing. Why would I join anybody else?" As reported by Slawterhouse, in 2000 at 5150, the band worked with Roth, writing new music, before falling out again. Eddie kept quiet, but made a rare appearance at the Los Angeles Police Department charity golf tournament in May 2001. Any band progress would have been interrupted on October 15, 2001, when Eddie and his wife of 21 years, actress Valerie Bertinelli, separated (though the couple would not file for divorce until December 8, 2005). In November 2001, Anthony claimed Roth had been working with the band again for a few months, but lawyers had shut it down. Anthony later denied this. The band was also dropped from Warner Bros., which had signed them in 1978. More positively, Eddie underwent treatment for cancer and announced his recovery on Van Halen's website in May 2002. After leaving Van Halen, Hagar has focused on his band The Waboritas as well as branching out into the Cabo Wabo nightclub, merchandise, and alcohol brands. In the summer of 2002, Roth and Hagar teamed up in the Song for Song, the Heavyweight Champs of Rock and Roll tour (also known as the 'Sans-Halen' or 'Sam & Dave' Tour). 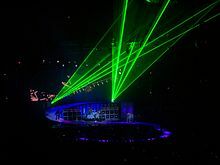 The tour, with both singers headlining, attracted media and audience fascination because it seemed more improbable than even a Van Halen tour with Roth or Hagar. It drew large crowds and featured no opening acts, Roth and Hagar alternating as the first act. Roth contrasted his personality with Hagar's: "He's the kind of guy you go out with to split a bottle with a friend. I'm the kind of guy you go out with if you want to split your friend with a bottle." Michael Anthony guested with Hagar's band, The Waboritas, numerous times and sometimes even sang lead vocals. During performances, Hagar would tease Anthony by asking, "Do the brothers know you're here?" Anthony never played with Roth. Cherone appeared on occasion. Hagar released a live album (Hallelujah), featuring vocals by Anthony and Cherone, and a documentary DVD, Long Road to Cabo, about touring with Roth. While the two singers promoted the tour and publicly claimed mutual respect, rumors of bitter acrimony and mutual loathing swirled. The allegations were later supported by backstage video, which showed the Roth and Hagar camps maintaining strict separation. Next, Hagar joined with Joe Satriani and Journey guitarist Neal Schon to form a side project, Planet Us, with Michael Anthony and Deen Castronovo (also of Journey) on drums. The band recorded just two songs and played live a few times before dissolving when Hagar and Anthony rejoined Van Halen. Mike Anthony was replaced as bass player by Eddie's son, Wolfgang Van Halen, in 2006. On September 8, 2006, Howard Stern's Eddie Van Halen live interview broke the band's long silence. Eddie said he was willing to reunite with Roth and revealed a solo album in the works. Eddie confirmed that Wolfgang had replaced Anthony on bass; Wolfgang had played bass alongside his father on some 2004 concerts. When queried about The Other Half tour, Eddie said Anthony could "do what he wants" now. This shocked and offended many fans. In November, Eddie's spokesperson, Janie Liszewski, claimed the Van Halen family was writing/rehearsing for a summer 2007 tour, which Billboard magazine's website shortly confirmed. However, the Van Halen website remained in the state it had been in since the Hagar reunion. In January 2007, Van Halen was inducted into the Rock and Roll Hall of Fame. The Van Halen brothers, Anthony, Hagar, and Roth were inducted, though only Hagar and Anthony appeared at the induction ceremony on behalf of the group. Billboard announced on January 24, 2007 that Van Halen would reunite with Roth for a U.S. tour. This was confirmed shortly after on the official Van Halen website. ^ a b Erlewine, Stephen Thomas. "Van Halen – Artist Biography". AllMusic. All Media Network. Retrieved August 16, 2014. ^ Edmondson, Jacqueline (2013). Music in American Life: An Encyclopedia of the Songs, Styles, Stars, and Stories that Shaped our Culture. ABC-CLIO. p. 161. ISBN 978-0-313-39347-1. ^ Harp, Justin (April 8, 2011). "Sammy Hagar: 'Eddie doomed Van Halen reunion'". Digital Spy. Hearst Magazines UK. Retrieved August 16, 2014. ^ "Van Halen – Biography". Archived from the original on May 5, 2009. Retrieved May 5, 2009. CS1 maint: BOT: original-url status unknown (link). Rolling Stone. Jann Wenner. Retrieved August 16, 2014. ^ Weinstein, Deena (2015). Rock'n America: A Social and Cultural History. University of Toronto Press. pp. 223–226, 244. ISBN 978-1-4426-0015-7. ^ Moore, Ryan (2010). Sells Like Teen Spirit: Music, Youth Culture, and Social Crisis. New York University Press. p. 105. ISBN 978-0-8147-5747-5. ^ "Van Halen". Rock & Roll Hall of Fame. ^ Bookbinder, Dave (April 19, 2017). "How This Band Rocked The Business World". ^ Duss, Matthew (September 7, 2007). "The Rise and Stall of Van Halen" – via American Prospect. ^ Pond, Steve; Pond, Steve (July 14, 1988). "Van Halen Feel the Burn". ^ Erlewine, Stephen Thomas. Van Halen at AllMusic. Retrieved July 28, 2014. ^ Haar, Pete Vonder (January 9, 2019). "Van Halen's 1984 Turns 35 Today, Is At Least The Second Best Work With That Title". Houston Press. ^ "Van Halen band career statistics". November 8, 2010. Retrieved September 20, 2013. ^ "Van Halen to Release First Concert Album With David Lee Roth". Retrieved January 20, 2017. ^ Gonzales, Victor (April 5, 2012). "Van Halen at BankAtlantic Center April 10". Miami New Times. Retrieved February 11, 2013. ^ Christe, Ian (2007). Everybody Wants Some: The Van Halen Saga. Hoboken, New Jersey: John Wiley & Sons. ISBN 978-0-470-53618-6. ^ "Rock the Net-VH1: 100 Greatest Hard Rock Artists". Retrieved February 16, 2017. ^ "Het Parool, geboorteregister van Amsterdam: Edward L. van Halen". ^ a b c "Eddie van Halen". Retrieved August 13, 2007. ^ "Eddie Van Halen". Guitar Player. January 2000. Retrieved November 23, 2008. ^ "Whiskey Articles". Whiskyagogo.com. Retrieved March 12, 2011. ^ Obrecht, Jas. "A Legend is Born Eddie Van Halen's First Interview". Musician's Friend. Archived from the original on December 18, 2008. Retrieved November 23, 2008. ^ "1970s: 100 Best-Selling Albums". All Info About Web Almanac. Archived from the original on January 5, 2007. ^ Prato, Greg. "Jump" at AllMusic. Retrieved July 28, 2014. ^ "RIAA Gold & Platinum Awards". RIAA. Retrieved April 15, 2019. ^ "Van Halen Bio". Yuddy. Archived from the original on August 28, 2007. Retrieved August 17, 2007. ^ Van Halen at AllMusic. Retrieved August 17, 2007. ^ "Van Halen". Retrieved August 17, 2007. ^ "Van Halen: 1984". Retrieved August 17, 2007. ^ "Van Halen favorite album and song". Archived from the original on October 23, 2007. Retrieved August 17, 2007. ^ Greene, Andy (March 24, 2016). "Van Halen's '5150': Sammy Hagar Looks Back". Rolling Stone. Retrieved April 17, 2019. ^ "34th Annual Grammy Award Winners". February 26, 1992 – via LA Times. ^ "MITCH MALLOY – Interview, September 2000". ^ "Audio: Mitch Malloy's Audition for Van Halen (1996)". ^ "Three Days Grace Ties Van Halen for Most No. 1s on Mainstream Rock Songs Chart". Billboard. Retrieved April 23, 2018. ^ "The big picture: The hands fell off the clock!". Classic Rock #28. June 2001. p. 6. ^ "Mad Anthony's Cafe". madanthonycafe.com. Retrieved March 12, 2011. ^ "Burrn! magazine interview paraphrase". 93x.com. Archived from the original on May 17, 2012. Retrieved June 19, 2015. ^ "Fired Van Halen Bassist: "I Found Out on the Internet"". Rolling Stone. Retrieved June 19, 2015. ^ Mccall, Tris (January 7, 2012). "Van Halen reunion: Album out soon, tour coming to NY and NJ". nj.com. ^ "Eddie Van Halen Goes Bananas on Howard Stern: The Full Highlights". Retrieved January 14, 2008. ^ "Eddie Van Halen Taps Teenage Son As New Bassist". Billboard. Retrieved June 19, 2015. ^ "EDDIE VAN HALEN: The Ball Is In DAVE LEE ROTH's Court". Roadrunnerrecords.com. Archived from the original on December 28, 2008. Retrieved June 19, 2015. ^ "Van Halen's Hot for Combat". Tmz.com. Retrieved June 19, 2015. ^ "2007 Rock and Roll Hall of Fame Inductee Profile". ^ Rock and Roll Hall of Fame Backs New Members Ben Sisario, January 8, 2007, The New York Times, "Rock and Roll Hall of Fame Backs New Members"
^ "Exclusive: Van Halen Reuniting With Roth For Tour". Retrieved January 14, 2008. ^ "Van Halen Press Release". Archived from the original on April 3, 2007. Retrieved January 14, 2008. ^ Boucher, Geoff (February 23, 2007). "Van Halen's road plans have taken a rocky turn". Los Angeles Times. Archived from the original on August 30, 2008. Retrieved November 23, 2008. ^ "Van Halen Tour On Hold But Still In The Works". Billboard. Retrieved March 12, 2011. ^ "announced on August 13, 2007, September 27". Davidleeroth.com. Retrieved August 14, 2007. ^ "Van Halen's Official Site Places Wolfgang In Time Machine". Archived from the original on September 26, 2007. Retrieved August 20, 2007. ^ Hicks, Brian (September 28, 2007). "Reunited Van Halen proves they still have what it takes". The Post and Courier. Retrieved November 23, 2008. ^ Kaufman, Gil (March 3, 2008). "Van Halen Postpone Tour Dates Due To Eddie's Unspecified 'Medical Tests'". MTV News. Retrieved November 23, 2008. ^ "World Entertainment News – Eddie Van Halen Back In Rehab?". KEYE-TV. March 5, 2008. Archived from the original on March 12, 2008. ^ "Valerie Bertinelli Denies Van Halen Rehab Reports". TransWorldNews. Atlanta, GA. March 12, 2008. Archived from the original on March 14, 2012. Retrieved December 25, 2010. ^ "Eddie Van Halen Talks About His New EVH Wolfgang Guitar". Ultimate-guitar.com. Retrieved March 12, 2011. ^ "Van Halen's Hand Surgery a Success". Spinner.com. July 24, 2009. Retrieved March 12, 2011. ^ "Dweezil Zappa – The Next Phase of Zappa Plays Zappa". Glide Magazine. May 20, 2010. Retrieved March 12, 2011. ^ "Blabbermouth.Net – Warner/Chappell Extends Agreement With Van Halen". Roadrunnerrecords.com. Archived from the original on February 25, 2011. Retrieved March 12, 2011. ^ "Van Halen Officially Working With Producer John Shanks - Blabbermouth.net". Roadrunnerrecords.com. January 21, 2011. Archived from the original on November 21, 2011. Retrieved June 20, 2015. ^ "Van Halen News Desk". Vhnd.com. July 16, 1978. Retrieved April 24, 2014. ^ "Blabbermouth.Net". Roadrunnerrecords.com. Archived from the original on May 23, 2016. Retrieved July 8, 2011. ^ "BLABBERMOUTH.NET – Producer Says VAN HALEN Is 'On Fire' And 'At The Top Of Their Game' On Forthcoming Album". Roadrunnerrecords.com. Archived from the original on July 15, 2011. Retrieved July 31, 2011. ^ "VAN HALEN Completes Mixing New Album". Blabbermouth.net. September 5, 2011. Archived from the original on January 2, 2012. Retrieved September 21, 2011. ^ Andy Greene (January 6, 2012). "Reunited Van Halen Play Blazing Show at Tiny NYC Club | Music News". Rolling Stone. Retrieved September 3, 2012. ^ "Van Halen's New Single Tattoo Cracks". Superloud.net. March 9, 2012. Archived from the original on May 12, 2012. Retrieved September 3, 2012. ^ "Van Halen Perform For 'Friends And Family' At Forum". Khitschicago.radio.com. February 8, 2012. Archived from the original on April 13, 2012. Retrieved April 8, 2012. ^ "Adele's '21' Hits 20th Week at No. 1, Van Halen Debuts at No. 2". Billboard. September 14, 2009. Retrieved September 3, 2012. ^ Christopher, Michael (February 8, 2012). "Van Halen | A Different Kind of Truth – CD Reviews". Thephoenix.com. Retrieved September 3, 2012. ^ "> News > VAN HALEN – A Different Kind Of Truth Hits The UK Charts". Bravewords.com. Retrieved September 3, 2012. ^ "Van Halen Cancel Summer Tour Dates". Spinner. May 18, 2012. Retrieved September 3, 2012. ^ "Van Halen/Kool & The Gang pairing a hit". U-T San Diego. Retrieved September 3, 2012. ^ Knopper, Steve. "Van Halen Postpone Summer Tour Dates". Rolling Stone. Retrieved May 17, 2012. ^ "Van Halen Getting Along Fine, Taking a Break, And Planning to Extend Tour!". vhnd.com. May 18, 2012. ^ "Van Halen Dates Officially Canceled". pollstar.com. June 29, 2012. ^ "'No further surgeries are needed': New health scare for Eddie Van Halen, but it's not cancer". somethingelsereviews.com. August 30, 2012. ^ Paul Cashmere (April 21, 2013). "Van Halen Play First Ever Australian Show With David Lee Roth For Stone Music Festival | Australia's Music News Authority". Noise11.com. Retrieved June 20, 2015. ^ "Van Halen's Definitive Live Album & Remasters (UPDATED with Ordering Info) | Van Halen News Desk". Vhnd.com. February 5, 2015. Retrieved June 20, 2015. ^ "Eddie Van Halen Gives Update On Van Halen And David Lee Roth". Blabbermouth.net. February 17, 2015. Retrieved June 20, 2015. ^ "VAN HALEN To Tour North America Summer/Fall 2015". Van Halen. Retrieved March 25, 2015. ^ "Van Halen 2015 North American Summer Tour Schedule". Archived from the original on April 2, 2015. Retrieved March 25, 2015. ^ "Eddie Van Halen Talks 'Tokyo Dome,' Van Halen Album Plans". Rolling Stone. April 3, 2015. Retrieved April 7, 2015. ^ "Van Halen 1982 Backstage Rider". The Smoking Gun. Retrieved March 15, 2011. ^ "Brown Out". Snopes.com. May 17, 2007. Retrieved December 8, 2009. Macdonald, Bruno (2006). Dimery, Robert (ed.). 1001 Albums You Must Hear Before You Die. New York: Quintet Publishing Limited. ISBN 0-7893-1371-5. OCLC 63515375. "Van Halen". Rock and Roll Hall of Fame. This page was last edited on 17 April 2019, at 02:55 (UTC).